Well, that didn't take long. The children are only back in school and everyone has already slipped into the usual routine, as if Christmas was something that happened last year! The days remain short and the nights are cold so it is the perfect time to find some fun events to get you through the month. As always, we have shortened the list, but you can find thousands of ideas for things to do in Ireland on YourDaysOut.ie. Having grown extensively since 2010, the festival will host over 100 events across 17 counties throughout Ireland in January. Events this weekend include First Light, an opportunity to see some of Ireland’s most engaging talent in Hawkswell Theatre in Sligo on Friday and The Glens Centre in Manorhamilton on Saturday and Sing Along Social in MVP, Dublin on Sunday. Sing Along Social is a zero commitment choir; just turn up and join in, singing (or humming) along to your favourite songs. If you wear your GAA county, club or Cúl camp jersey you get half-price admission to the Croke Park Stadium Tour during the month of January. Walk in the footsteps of legends on this guided tour, as you visit the team dressing rooms, warm-up areas and media centre before going pitch-side via the players' tunnel and taking a seat in the VIP area. The Stadium Tour also includes admission to the GAA Museum. The popular Art & Craft sessions continue every Saturday morning in Rua Red, South Dublin's Art Centre. They have now split the session into different 3-7 and8-12-year-oldd age groups from 10:30-11:30. As well as being creative children will learn about contemporary art and the themes behind the exhibitions. The first festival of the year continues in Belfast with perfomances this weekend including the Booka Brass Band on Friday night, The Irish Video Game Orchestra on Saturday and a converstion with punk pioneer Cosey Fanni Tutti on Sunday afternoon. First join Eimear Murphy at 11:30am on Saturday morning for a creative workshop inspired by Turner’s landscapes - Tearing through Nature with Turner - where children of all ages can ceate their own dramatic landscapes by tearing and sticking collage materials. Then join the family tour at 12:30pm; specially designed to make the works on display fun and engaging for kids. Miriam Lambert, is delighted to present 'Goldilocks and the Three Bears' in the Belltable, Limerick on Saturday. Peek and Boo, Miriam’s signature characters guide the children to the tale of a little girl who pays a visit to the home of the adorable baby bear! After the show, Miriam will also host a Puppet-Making Workshop where children can make their very own take-home puppets! All materials are included in the workshop cost. Want to get out and get active? Green Shed will be starting up again this Saturday, 13th January, 10.00am - 12.30pm. The project is based in the bogland and forests of the Sperrin foothills and offers the chance to get involved in practical environmental conservation activities as well as promoting traditional skills, materials and techniques. No skills required. Introducing toddlers from 18 months to 4 years to drama, music and movement for the very young. Sing play and dance with your child who will also enjoy nursery rhymes, action songs and toddler games that will help develop confidence from a very early age. Starting this Saturday at 10:30am in Hawk's Well Theatre, Sligo. This colourful, fast-paced all singing and dancing show is a fun and gentle re-telling of the classic fairy-tale of Little Red Riding Hood. Little Red Riding Hood is adventuring through the woods to visit her Granny, but somewhere along the way the Silly Billy Wolf is waiting. Children with have great fun joining in on the action, singing songs and playing games and meeting some amazing characters in this original show, with two performances on Sunday in the Balor Arts Centre in Ballybofey. A classic pantomime for all the family, based on Lewis Carroll's popular tale about Alice chasing the White Rabbit into Wonderland, continues in Draiocht until Sunday, January 21st. It’s a topsy-turvy place that gets ‘curiouser and curiouser’ as Alice meets unforgettable characters – the Mad Hatter, the Cheshire Cat, Queen of Hearts, Tweedledum and Tweedledee featuring lots of song, dance and fun. 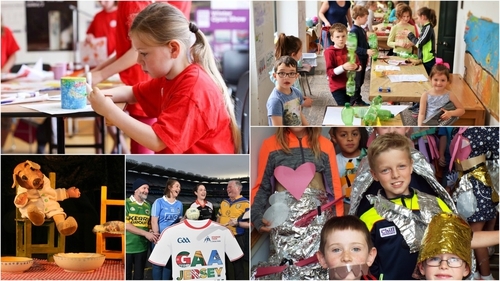 Drop in Arts & Crafts continue this month in the Hunt Museum in Limerick, every Saturday from 12:00 - 13:00. Children from three can create crafts based on a specific theme which are linked to objects on display in the Jewellery Room. Funderland has been entertaining families and friends in Dublin throughout December. You still have time to experience all the thrills and spills of the fair, as the attractions, rides and i-Skate continue until Sunday 14th January. Why doesn't your family or friends try something completely different this month with a new challenge from Celtic Escape Rooms in Athlone. Follow Alice down the rabbit hole and fall into a mysterious room with many locked doors and drawers of all sizes and escape the room before the Queen of Hearts shouts "Off with her head!". Definitely not short of choice!